If you are searching for the right place to "live the good life," whether it be a little cabin in the woods, a beautiful home on the water's edge, or a place high on a ridge with an incredible view, Eufaula is just the place for you. Lying literally on the banks of Lake Eufaula, there is a "special" place for any life-style you might enjoy. The city is not marked by crowded freeways or congested parking lots, but you will find everything to fill your needs with a vacation paradise around Oklahoma's largest lake. Early Creek settlements had been established because of the land, attracting farmers and wild game) and by the Texas Railroad. This is what drew people to the fork of the Canadian Rivers. Some of the first towns in the area were North Fork Town, and Micco Post Office. With the Missouri, Kansas, and Texas (MKT) Railroad being built through the area in 1871, the railroad built a train station in Eufaula (named by the Creek Indians who came to Oklahoma from the Creek Tribal town of Eufaula, Alabama. Eufaula is from a Muskogee-Creek people word meaning "loosely this place and split into many places", probably referring to an early tribe which moved traditionally to several different locations. The people of North Fork Town and Micco Post Office soon moved there. In some stories North Fork Town burned to the ground in the Civil War, in others, North Fork and Micco Post Office just vanished. Walk along the brick sidewalks and admire the Victorian buildings in Eufaula's 20 Block Historic downtown which is listed on the National Register of Historic Places. 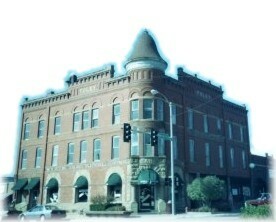 The Foley Building that housed the State National Bank towers magnificently at the corner of Main Street.